When your Mac is no longer the shiny new kid on the block, there’s no shortage of ways to extend its useful life. An old Mac can work as a recipe-storage library, for instance, and that antique iBook can be a backup drive. But when you’ve run out of ways to reuse or repurpose your old Mac, what’s the best way to recycle it? Here are a variety of solutions—from low-effort to time-intensive—that’ll keep your conscience and your closet clear. California, Maine, Maryland, Minnesota, Oregon, Texas, and Washington now have laws regulating where and how you can dispose of unwanted electronics. But in most others, it’s still legal to throw your computers in the trash. According to a recent 60 Minutes report, an estimated 130,000 computers end up in the garbage annually. There are all kinds of good reasons not to make yours one of them: lead, mercury, and hexavalent chromium are three of the best. These substances, which are embedded in our computers’ assorted parts, are just a few of the toxins that can be released into the environment if an old computer or iPod is just tossed onto a scrap heap and burned. Once in the groundwater or air supply, heavy metals and PCBs released by improperly disposed-of computers linger as cancer-causing compounds. Before you dispose of an old computer, make sure you wipe it clean of all your data. The first step is to back up all the data on the device’s hard drives. Either copy it to your new machine or pick up an external hard drive and use that as a repository for all the old files. To duplicate the contents of the old drive, use Time Machine. Or if your old system doesn’t have OS X 10.5, try Carbon Copy Cloner (payment requested; ). Now erase your footsteps. Start by deauthorizing iTunes. You don’t want to later realize that you have one less machine you can play your old, pre-iTunes Plus music on. Then deauthorize any third-party programs you’ll want to reinstall on your new system. Next, wipe your hard drive. Track down the installation discs that came with your computer (or use the ones that came with any OS X upgrade you purchased). Insert Disc 1 (CD) or the installer disc (DVD), launch Installer, and reboot the machine using the software on the disc. Go to the Installer menu, choose Open Disk Utility, select the hard-drive icon in the column on the left, click on the Erase tab, and then click on Options. The 8 Way Random Write Format will scramble your data nicely. Now that your soon-to-be-departed Mac is wiped clean, it’s ready for recycling or donation. If your computer is still in working order, consider donating it. The research firm Dataquest estimates that less than 5 percent of all personal computers find a second life at a charity or school. You can increase that percentage by recycling your old electronics with a nonprofit facility. Such an organization will try to match your old electronics equipment with a school or a charity that can use it. To find a nearby nonprofit or school-based recycler, go to TechSoup’s TechFinder online directory, type in your zip code, and then narrow the results by selecting Computers or Printers And Peripherals from the Technology pull-down menu on the results page. The Electronic Industries Alliance also maintains a list of donation programs. If your old goods are only a year or three old, you might be able to sell them for petty cash. In addition to the obvious outlets like eBay (check out its guide to selling electronics) and Craigslist, a crop of services that buy used electronics has grown online. The auction site eBay has a great guide to selling used electronics. You won’t make a handsome profit—a first generation iPod mini with the original manuals nets you all of $9 on Gazelle.com—but you’ll have less clutter and a little more cash for your trouble. The way most of these sites work is pretty straightforward. You fill out a form detailing what you have, what condition it’s in, and whether you still have the original manuals, software, or power adapters (as applicable). The site will give you a quote and let you print out a mailing label to ship off your gadget. Assuming the site shares your assessment of your old gadget’s condition, you’ll get a check. You usually pay the postage for these transactions. NextWorth, BuyMyTronics, and Consumer Electronics Recycling will take older iPhones and iPods. The services VenJuvo and Gazelle.com take laptop computers, while My BoneYard also takes desktop computer systems. You could repurpose your 2002 iMac as a digital jukebox or use your fist-generation iPod as an external hard drive. Alternatively, you could ransack your old hardware and peripherals for parts and pieces you can use in myriad ways. While the rise of flat-screen iMacs has, regrettably, lessened the potential for a next-generation Macquarium, smaller devices and peripherals still provide an opportunity for creative expression. For example, craftspeople on sites such as Etsy.com and eBay have begun disassembling Apple’s old keyboards and repurposing the keys as earrings, hair clips, and cufflinks. Feeling creative? Pillage your Mac stuff for raw crafts materials, as Lauren Anabela Beaudoin does for her Mac keyboard jewelry. Metalsmith Lauren Anabela Beaudoin makes jewelry with her old Mac parts. 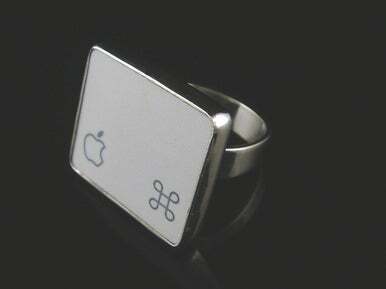 Her first bauble was a ring crafted from an escape key, meant to remind the user to take a break from working. Another etsy crafter, Alicia Murphy-Rodriguez, began making her jewelry after a spilled drink ruined her first keyboard. She now stockpiles raw materials via eBay and yard sales. If you’re not feeling artistic or if your device is too ancient for secondhand use, then it’s time to find an electronics recycler. Your first step is to find out whether the retailer you bought the product from offers an electronics-recycling program. Apple’s consumer recycling program, which is also open to education purchasers and small businesses, is fairly straightforward. When a customer purchases a new or Apple-certified refurbished Apple computer or Apple Cinema Display monitor, that customer can send one computer, one monitor, and peripheral computer equipment back to Apple for recycling. The best part of the program is that the recycled parts don’t have to be made by Apple—so you can take advantage of the program to buy a shiny new MacBook and unload that Windows PC desktop you have sitting around. There are some restrictions. The program applies only to the contiguous 48 states and Washington, D.C. And if you’re shipping anything with a display screen measuring more than four inches diagonally, you’re going to be charged a California environmental fee (because Apple is headquartered there). Finally, you can’t bring your old system in to an Apple store and drop it off when you pick up your shiny new computer. Apple requires that you box up your old system, print the Apple-provided shipping labels, and then drop the boxes off at a FedEx location. Those of you looking to recycle old iPods or iPhones have it slightly easier: all you have to do is visit the iPod and Mobile Phone Recycling page, fill out a form detailing what you’ll be recycling, and print out a pre-paid mailing label. Once you’ve packaged and labeled your items, you can drop them off at the nearest post office. If your electronics aren’t eligible for manufacturer recycling, you do have some third-party alternatives. For computer-disposal options that are small in scale and cost, look for facilities that focus on electronics recycling, like Earth911.org. Its site has a recycling database that lists all the nearby places that take your goods, along with maps to help you find them. Results will vary by location, and broader search terms produce better results. 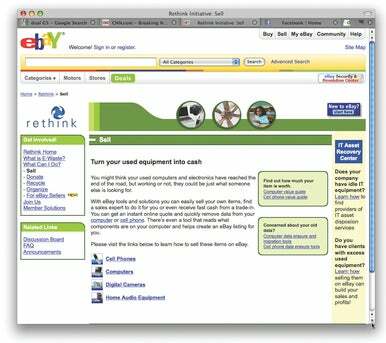 If you’re not satisfied with what you find there, a few other sites will point you toward recycling resources. The Consumer Electronics Association site My Green Electronics lists municipal and private recycling facilities, while the Telecommunications Industry Association’s Find a Recycler site lists recyclers by state; site visitors then have the option of sorting their regional recyclers by program type (private, non-profit, or municipal) or zip code. In case you’re casting about for someplace to drop off unused peripherals, Office Depot sells Tech Recycling Boxes for $5 to $15; you buy the box, fill it with electronics and peripherals, and then return the unsealed box to an Office Depot for recycling. Part of the reason consumer-electronics recycling is such a mess is that responsible disposal is only now becoming part of the upgrade process. Fortunately, many retailers and electronics vendors are following Apple’s lead and integrating recycling into the electronics lifecycle; mobile phone vendors like Verizon, T-Mobile, and AT&T all offer free phone recycling. Before purchasing that next gadget, find out what recycling programs the manufacture has in place. Once you’re done wiping, crafting, shipping, or dropping off all your old electronics, take comfort in knowing that we’re at the end of Recycling 1.0. If the recycling aspect of electronics disposal keeps pace with technology as a whole, the next time you need to get rid of an obsolete gadget, it’ll be an easier, more elegant process. Lisa Schmeiser is a reporter in the San Francisco Bay Area. She also blogs at schmeiser.typepad.com. Lisa Schmeiser is a San Francisco-based reporter, editor and blogger. She also publishes a thrice-weekly news digest, So What, Who Cares? , and podcasts regularly at The Incomparable.